Sorry for the delay in getting this edition of your favorite newsletter of the weird and strange out to you...but virulent bugs have been rampaging through the Conspiracy Journal newsroom rendering almost everyone incapable of performing even the simplest of tasks. This issue will be somewhat smaller than normal...but, hopefully, Friday's issue will be back to normal length. Thanks to everyone who have sent us this editions fascinating articles. If YOU see an interesting story that you think is just perfect for Conspiracy Journal, then send it to us right away. Please be sure to include a link from the source. We depend on story contributions from our subscribers and friends to keep this newsletter going each and every week. 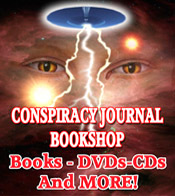 At the start of this new year, 2011, I would like to encourage you to pay a visit to the Conspiracy Journal Bookshop. We carry a fantastic assortment of items that are sure to please anyone interested in UFOs, the paranormal, conspiracies, weird science and much, much more. The Conspiracy Journal Bookshop uses PayPal, and since PayPal accepts most major credit card, it has never been easier to order a book, DVD, or audio CD. If you don't like using PayPal, we have other methods for you to order. Just drop us an email at: mrufo8@hotmail.com and we will let you know how you can call us and order on the phone with your credit card, or how to mail us a check or money order. The online Conspiracy Journal Bookshop offers only a part of Global Communications vast catalog of interesting products, if you would like to receive our free, print catalog, send your name and mailing address to the above email. We add new products to the online bookshop every week, so visit often and see what's new. We really depend on your purchases of our items to keep the CJ Newsletter coming to you each and every week. So if you enjoy the free newsletter, help support us by buying something from our bookshop. Despite the intense skepticism, a small community of scientists is still investigating near-room-temperature fusion reactions. The latest news occurred when Italian scientists Andrea Rossi and Sergio Focardi of the University of Bologna announced that they developed a cold fusion device capable of producing 12,400 W of heat power with an input of just 400 W.
Recently, the scientists held a private invitation press conference in Bologna, attended by about 50 people, where they demonstrated what they claim is a nickel-hydrogen fusion reactor. Further, the scientists say that the reactor is well beyond the research phase; they plan to start shipping commercial devices within the next three months and start mass production by the end of 2011. The fact that Rossi and Focardi chose to reveal the reactor at a press conference, and the fact that their paper lacks details on how the reactor works, has made many people uncomfortable. The demonstration has not been widely covered by the general media. However, the day after the demonstration, the scientists answered questions in an online forum, which has generated a few blog posts. Steven B. Krivit, publisher of the New Energy Times, noted that Rossi and Focardi’s reactor seems similar to a nickel-hydrogen low-energy nuclear reaction (LENR) device originally developed by Francesco Piantelli of Siena, Italy, who was not involved with the current demonstration. In a comment, Rossi denied that his reactor is similar to Piantelli’s, writing that “The proof is that I am making operating reactors, he is not.” Krivit also noted that Rossi has been accused of a few crimes, including tax fraud and illegally importing gold, which are unrelated to his research. Rossi and Focardi have applied for a patent that has been partially rejected in a preliminary report. According to the report, “As the invention seems, at least at first, to offend against the generally accepted laws of physics and established theories, the disclosure should be detailed enough to prove to a skilled person conversant with mainstream science and technology that the invention is indeed feasible. … In the present case, the invention does not provide experimental evidence (nor any firm theoretical basis) which would enable the skilled person to assess the viability of the invention. The description is essentially based on general statement and speculations which are not apt to provide a clear and exhaustive technical teaching.” The report also noted that not all of the patent claims were novel. Giuseppe Levi, a nuclear physicist from INFN (Italian National Institute of Nuclear Physics), helped organize last Friday’s demonstration in Bologna. Levi confirmed that the reactor produced about 12 kW and noted that the energy was not of chemical origin since there was no measurable hydrogen consumption. Levi and other scientists plan to produce a technical report on the design and execution of their evaluation of the reactor. The recent wave of deaths of animals around the world - of fish, birds and, as a new story at today's Anomalist reveals, hundreds of cattle - has generated a wealth of theories for the deaths that range from perfectly natural "die-offs" to a coming apocalypse of Biblical proportions, and just about anything and everything in between. An issue that has not been addressed at length, however, is that relative to concerns that elements of the government may have with respect to these events. Is there official, behind-the-scenes worry about what is presently afoot? Very possibly. And I say "very possibly" because official, governmental concerns about the nature of sudden animal deaths - and animal disease - have been in evidence for decades. If, that is, one knows where to go looking for that same evidence. Bacteriological Warfare in the United States is a fascinating FBI document – declassified into the public domain via the terms of the Freedom of Information Act - that covers the years 1941 to 1950. Notably, of the file’s original 1,783 pages, no less than 1,074 have been firmly withheld from declassification by the FBI. The file reveals a wealth of illuminating and disturbing data on animal disease and death, and their potential, theoretical links to bacteriological warfare and sabotage by enemy nations and individuals. “The complete record of sabotage carried out by Chernov, supposedly of the German Intelligence service in Russia during 1930 to 1936 is too long to put into the book according to the authors, but includes - killing off pedigree breed-stock and raising cattle mortality by artificially infecting cattle with various kinds of bacteria – effecting a shortage of serum to counteract epidemics of anthrax so that, in one instance, 25,000 horses perished as a result of Chernov’s sabotage – infecting tens of thousands of pigs with erysipelas and with certain plagues by having virulent bacteria placed in medicinal sera. The FBI elaborated further: “Anton Dilger, a German-American medical graduate from John Hopkins University, was in Germany when the First World War broke out. He offered his services to the Kaiser, and was promptly detailed by Colonel Nicolai to do secret service work in the United States. Dilger returned to America with a supply of cultures of glanders and anthrax germs. Financed by von Papen, he set up a laboratory in Chevy Chase, near Washington, and started breeding germs on a large scale for infecting mules, horses, and cattle awaiting shipment to the allies. “This man then organized a band of some twelve assistants to travel around the country, carrying Dilger’s germs in small glass phials stopped with corks through which a needle extended. This roving band jabbed their deadly needles into the livestock. And, one year later, the FBI was still collecting such data. On October 19, 1950, the FBI prepared a document titled Abnormal Loss of Hogs in Nebraska and Illinois that dealt with an unusually high number of hog deaths in the aforementioned states - as a result of cholera. The files, however, make it clear that, in official, FBI quarters, the nature of the animals’ deaths had been viewed with deep suspicion. It was concluded that the deaths were due to a “variant virus” or “atypical virus” that stemmed from “local conditions and the physical conditions of the hogs.” The important factor, however, is that this document was found within a file specifically focused upon bacteriological warfare. In other words, the FBI was still looking closely at any and all animal deaths that might not have wholly conventional explanations. Of great significance is the fact that one of the cases that the FBI examined – and that is described in a heavily-redacted memo of May 29, 1950 – dealt with the discovery of plague-infected rats at the highly sensitive Sandia Base, New Mexico, and which was viewed in some quarters as being the result of nothing less than a deliberate attempt to clandestinely introduce a widespread plague on Sandia by hostile, unknown sources. Significantly, the Sandia Base was, from 1946 to 1971, the primary nuclear weapons installation of the Department of Defense. Moreover, a document prepared by the FBI’s Special-Agent-in-Charge at its Albuquerque, New Mexico office on June 22, 1950, titled Bacteriological Warfare – Espionage-Sabotage (Bubonic Plague), refers to rumors then flying around the official world that an outbreak of bubonic plague in New Mexico’s rat population may have been the result of deliberate, bacteriological warfare-related activities by – once again - hostile, unknown forces. And, in essence, those are the significant, declassified portions of the file that relate to animal disease and death that some perceived as potentially sinister in nature. We now know that senior elements of, and agencies within, the government were taking a deep – and secret – interest in cases of potentially unusual disease and death in the U.S. animal population in the 1940s and 1950s. We may also consider it highly likely that very similar, secret interest and concern is afoot today with respect to the recent wave of bird, cattle and fish deaths that have so dominated the news in the last month or so - regardless of the ultimate reasons behind the deaths. In the weird world of quantum physics, two linked particles can share a single fate, even when they’re miles apart. Now, two physicists have mathematically described how this spooky effect, called entanglement, could also bind particles across time. If their proposal can be tested, it could help process information in quantum computers and test physicists’ basic understanding of the universe. 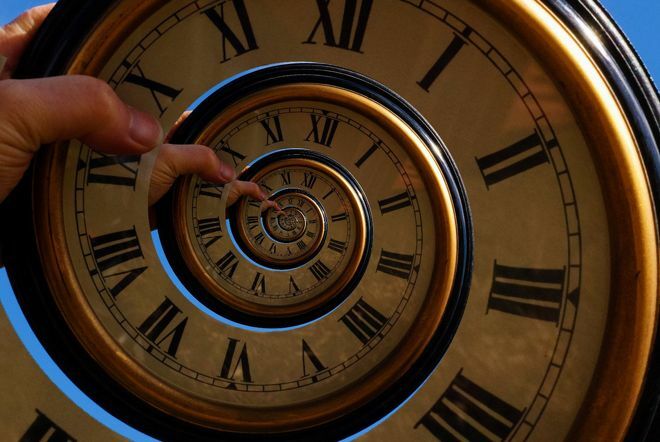 “You can send your quantum state into the future without traversing the middle time,” said quantum physicist S. Jay Olson of Australia’s University of Queensland, lead author of the new study. In ordinary entanglement, two particles (usually electrons or photons) are so intimately bound that they share one quantum state — spin, momentum and a host of other variables — between them. One particle always “knows” what the other is doing. Make a measurement on one member of an entangled pair, and the other changes immediately. Physicists have figured out how to use entanglement to encrypt messages in uncrackable codes and build ultrafast computers. Entanglement can also help transmit encyclopedias’ worth of information from one place to another using only a few atoms, a protocol called quantum teleportation. In a new paper posted on the physics preprint website arXiv.org, Olson and Queensland colleague Timothy Ralph perform the math to show how these same tricks can send quantum messages not only from place to place, but from the past to the future. The equations involved defy simple mathematical explanation, but are intuitive: If it’s impossible to describe one particle without including the other, this logically extends to time as well as space. Olson explained them with a Star Trek analogy. In one episode, “beam me up” teleportation expert Scotty is stranded on a distant planet with limited air supply. To survive, Scotty freezes himself in the transporter, awaiting rescue. When the Enterprise arrives decades later, Scotty steps out of the machine without having aged a day. According to quantum physicist Ivette Fuentes of the University of Nottingham, who saw Olson and Ralph present the work at a conference, it’s “one of the most interesting results” published in the last year. One such interesting thing could involve storing information in black holes, said physicist Jorma Louko, also of the University of Nottingham. Entanglement in time could also be used to investigate as-yet-untested fundamentals of particle physics. In the 1970s, physicist Bill Unruh predicted that, if a spaceship accelerates through the empty space of a vacuum, particles should appear to pop out of the void. Particles carry energy, so they would be, in effect, a warm bath. Wave a thermometer outside, and it would record a positive temperature. Called the Unruh effect, this is a solid prediction of quantum field theory. It’s never been observed, however, as a spaceship would have to accelerate at as-yet-unrealistic speeds to generate an effect large enough to be testable. But because timelike entanglement also involves particles emerging from vacuums, it could be used to conduct more convenient searches, relying on time rather than space. Finding the Unruh effect would provide support for quantum field theory. But it might be even more exciting not to see the effect, Olson said. 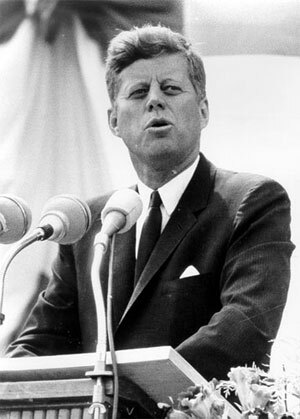 It was fifty years ago on January 20 that John F. Kennedy was sworn in as the 35th President of the United States. While historians debate over the nature of his legacy -- whether as just another proponent for the military-industrial complex who actually got the U.S. further embroiled in Vietnam, or as a possible renegade with a vision of a different future, who was eliminated before matters got out of hand -- there is no question that there was something about the man that brings the world back to him, again and again. Yes, it was youth, that sense of style, that energy -- above all the sense of possibility that pervaded the man himself. His assassination, essentially a public execution, finalized the image and gave the entire world a sense of loss from which it has never fully recovered. I am convinced that the day will come when we as a society will agree that JFK was killed in a conspiracy, something involving elements from within the U.S. national security establishment. The truth on that matter will not remain buried forever. So many people already know that the official statements of the U.S. government -- that is was all the work of one single unstable individual -- are false. Clinton may not have realized how closely the two questions may have been connected. Consider the likelihood that there is indeed a UFO reality and -- of necessity -- a UFO cover-up. Could Kennedy’s assassination have been related to the latter? The world of conventional wisdom would never pause to consider this, but -- really -- why is this so difficult to imagine? The Kennedy assassination is something like Agatha Christie’s Murder on the Orient Express. Everyone had a motive: the Mafia, the CIA, the Cubans, the Pentagon, the Soviets, and the Federal Reserve, for starters. Could that list also include Majestic Twelve, the name often ascribed to the powerful insiders who control the UFO secret? My answer to that question is, why not? We must recall that the UFO topic remains the great hole in our modern history. The great unspoken reality around which so much has happened within classified circles, and about which so little has leaked to the outside world. There is an enormous history there, waiting for future researchers to describe, once the repository of data becomes available. And it will. Make no mistake, it will. Something as important as UFOs would not have escaped the attention of JFK. Throughout the 1950s, American newspapers reported sightings of the “flying saucers” much more seriously than they do today. The topic was major news several times during the decade. We know, furthermore, that at classified levels, the topic was taken very seriously. Why then, would Kennedy not have been interested? More to the point, how would it be possible for him not to have known something about it? The Killgallen-Rothberg conversation revolved around the fact that Monroe was telling secrets to select Hollywood insiders regarding her liaisons with the President, one of which was “a visit by the President at a secret air base for the purpose of inspecting things from outer space.” The conversation between Monroe and RFK focused on her anger at the Kennedys, the sensitive information she had in her journals, and her willingness to give a “tell all” press conference. The document bears the signature of James Jesus Angleton, head of Counterintelligence at the CIA. Although the document lacks the kind of provenance that would make it of undisputed authenticity, I am one of the researchers who believes it is genuine. You can see the document and read more about it here. So it looks like JFK was not only very interested in UFOs, but had connection to the topic in his capacity as President. Whether or not he was killed for reasons having to do with UFOs is not something on which I would care to pronounce a judgment. But I would say that, given the circumstances of his Presidency, it cannot be ruled out. Like many people who have reviewed the life and Presidency of JFK, it’s my feeling that we lost something very important on that dark day of his assassination. What we lost was the implicit bond of trust that existed between the American people and their government. The system that had been evolved for a century and a half, which despite all imperfections had moved in fits and starts toward greater power to the people, had made a great transformation during the Second World War. That was when the American republican system government became increasingly swallowed up by a “national security state.” It did not take new boss very long before it decided to remove the President in what became for all intents and purposes a silent coup d’etat. Thus for good reason are we unable to look back at JFK, at the era of Camelot, and avoid that feeling in the pit of our stomachs. That feeling of loss, and the conviction that his assassination was a criminal action yet to be punished, or even acknowledged. Yet, I prefer to remember something else about JFK. He was, without question, one of the greatest orators in American history. Much of that was thanks to Ted Sorenson, one of the greatest speechwriters any President was fortunate enough to have. But surely JFK had something to do with it, too. So I would like to take a moment to re-read a classic statement made by the man. It was from a speech made at the Waldorf Astoria Hotel in New York on April 27, 1961. He gave it to the National News Publishers Association. His subject: the dangers of secrecy. If we want to honor the memory of JFK, we can do no better than to live by these words, and to fight what is most assuredly the best fight of our lives. It is the fight to bring truth to this world, to shine light into the darkness, to scatter the forces of evil. 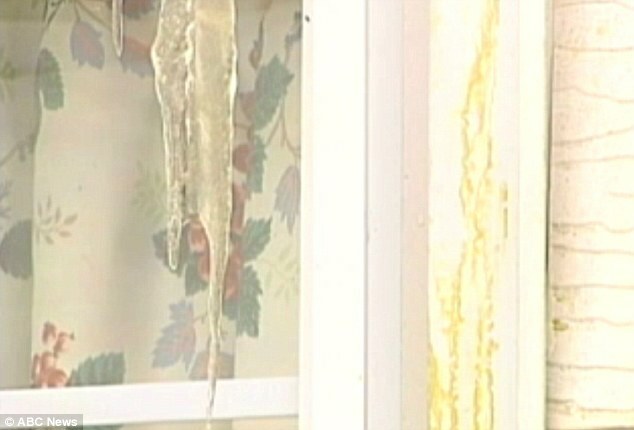 The FAA has launched an investigation after a mysterious greenish-yellow goo fell from the skies and splattered homes in Snyder, New York on Tuesday, Jan. 18. Neighbours said the mystery substance appeared between the hours of 9am and midnight last Tuesday.